Sunday bonus post! This week will have lots of random posts here and there as I wrap up things for 2013. 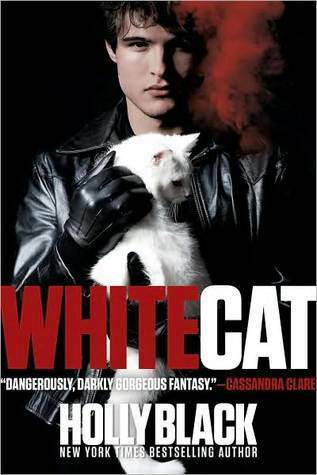 For starters, here’s a review of White Cat by Holly Black. To be honest, I had very few expectations going in to reading this book, which I don’t think was a bad thing. In fact, it was kind of nice. I’ve only read one other book by Holly Black, Tithe, which was very good, but it was clear that this book was going to be completely different. Our main character is Cassel Sharpe, the youngest of three brothers. Most of Cassel’s family are “workers,” or basically, people who can use magic to affect people in different ways. There are many different types of workers: death workers, who can kill you, emotion workers, who play with your emotions, luck workers, who can change circumstances in your favor (or against your favor), and so on. The problem with Cassel – he’s not a worker at all. In this world (which is basically our world, just with magic), workers are generally seen as criminals, since the things they can do can be used to take advantage of people. Cassel’s mother is actually in jail because of this. Most people wear gloves, since curse work can only be done if your bare hand touches skin, and since people are wary about being around people without gloves, everyone wears them, even if they aren’t workers. The thing is, many workers are pretty much part of large Mafia-like crime families, including Cassel’s family. Poor Cassel just wants to have a normal life, but he’s also sleepwalking and having visions of this white cat all the time. He is also haunted by the knowledge that he killed a girl that he had a crush on, although he doesn’t remember how. This book was twisty and turny and a lot of fun to read. My only complaint (and it’s fairly minor) is that I wish some of the explanation about curse work could have come out sooner. Authors do this all the time and it does get on my nerves – they expect me to understand things they haven’t told me yet. It pulled me out of the story a bit at the beginning, but the rest of the story pulled me back in. It’s a tale of magic and lies, about the exhilaration that comes with running a con, and most importantly, the very complicated relationships within families. It’s always better when you have low expectations and are pleasantly surprised rather than the other way around! I’ve heard mixed reviews about this one. It does sound intriguing though so might get around to it in 2014.